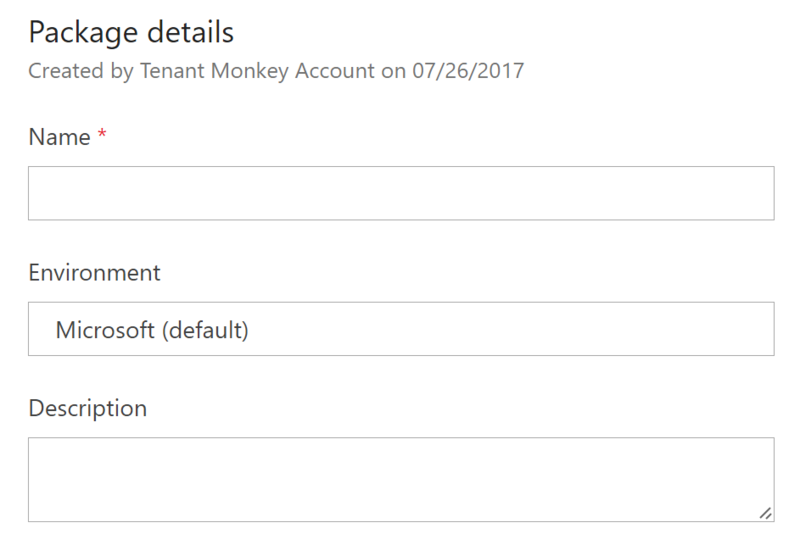 We’re very happy to announce that you no longer have to manually move your apps by locally saving .msapp files from your DEV/UAT environment and re-saving the apps in your production environment from PowerApps Studio. The preview of packaging is now available on web.powerapps.com. With packaging, you will be able to export an app as a package and import it into another environment. 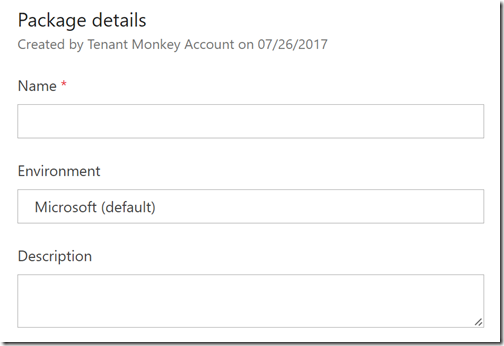 NOTE: Once the preview is over, you will be required to have a PowerApps Plan 2 trial or PowerApps Plan 2 paid license in order to access the packaging feature. Once the package has been uploaded you will need to review the package contents and will need to provide additional input for any item marked with a red icon by selecting the wrench icon for each item and entering the required information. NOTE: If you are importing an app and chose to Update an existing app, the new changes will be saved as a draft of the applications. You will need to publish those changes in order for them to be available all other users of the applications. Which resources can be packaged? When you export an app, the dependent resources for your app will also get exported into the package. Initially only a subset of all possible resource types will be supported as outlined in the table below. Create new – the app will be created as a new app into the environment where the package is imported. Update – the app already exists in the environment and will be updated when this package is imported. Create new – the flow will be created as a new flow into the environment where the package is imported. Update – the flow already exists in the environment and will be updated when this package is imported. NOTE: All resources that the flow depends on will also be included within the app package is exported and will need to be configured when it is imported. Overwrite – If there's a resource with the same name, this import will replace it. If there isn’t a matching resource, a new resource will be created. 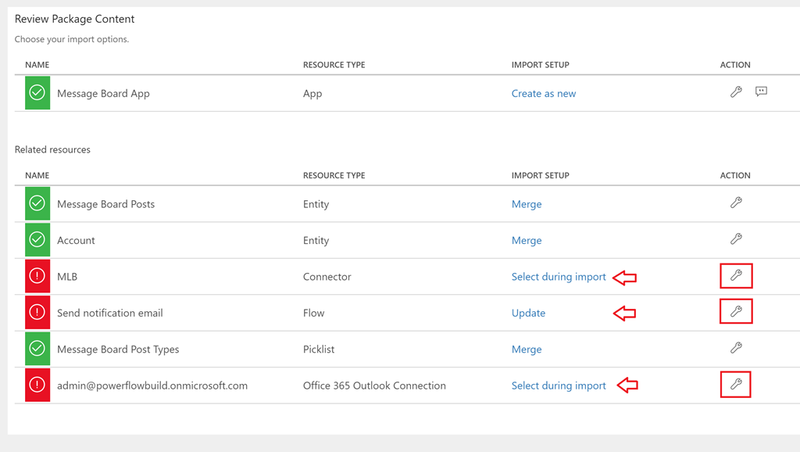 Merge – If there's an entity or picklist with the same name, new fields or entries will be added, but missing fields or entries won’t be removed. 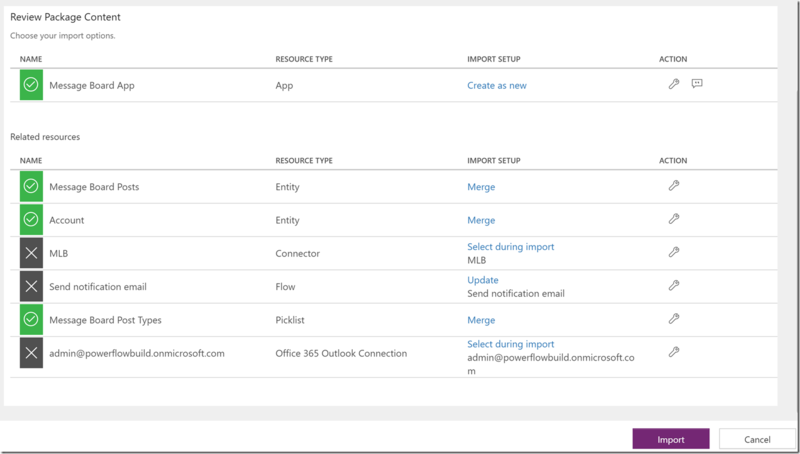 Custom Connectors No If an app depends on a custom connector we do not currently support exporting the connector as a part of the package. 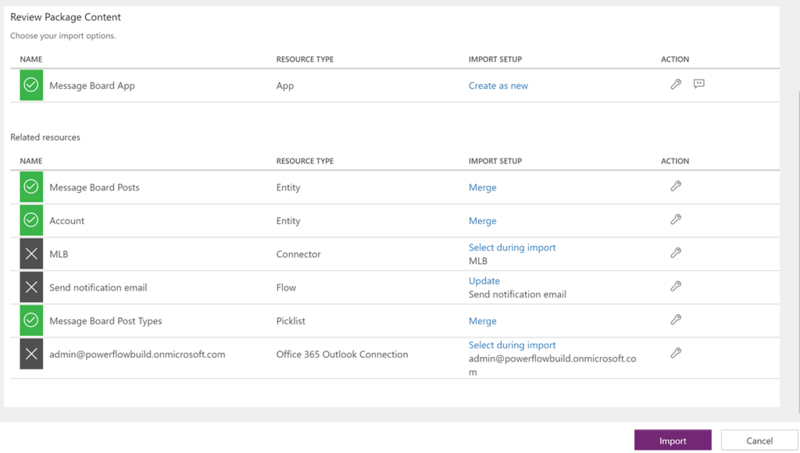 If you have an app that relies on a custom connector, your only current option is to manually re-create or update the connector in your target environment and select that connector when you import the package. 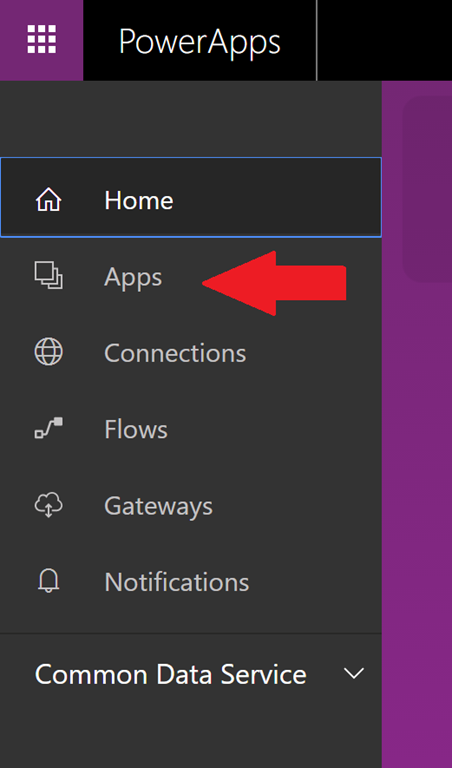 Connections No If an app depends on a connection (such as a SQL connection w/ credentials) we do not currently support exporting the connection or credentials as a part of the package. If you have an app that relies on a shared connection (like SQL), your only current option is to manually re-create that connection with the appropriate credentials in your target environment and select that connection when you import the package. CDS Custom Roles and Permission Sets No Exporting custom CDS roles and/or permission sets is not currently supported. Importing app packages that contains more than ~3 resources has been reported to take several minutes to complete. We will be rolling out a fix for this within the next two weeks. Ability to export/import custom connectors This work is on the backlog and we are working to deliver this within the next 6 months. (for example switch from one SharePoint list or SQL database to another) This work is on the backlog and we are working to deliver this within the next 6 months. Ability to export/import CDS Custom Roles and Permission Sets This work is on the backlog and we are working to deliver this within the next 6 months. Ability to export/import CDS data (i.e. sample data rows) This work is on the backlog and we are working to deliver this within the next 12 months.